For aspiring oceanographers, few experiences offer more opportunities for practical, hands-on training than working at sea aboard a research vessel. This “shipboard experience” gives early-career ocean scientists valuable insight into the logistics required to plan and execute a successful research cruise, as well as the realities of conducting scientific research in an unpredictable environment. Dalhousie University and BIOS, both global leaders in marine science education and research, are launching a joint initiative that provides a new experiential learning program for students in oceanography. 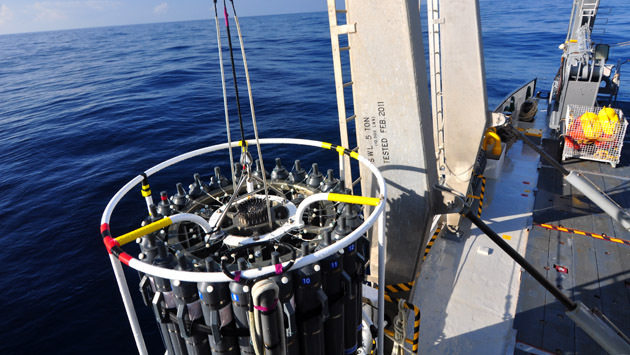 The Dalhousie-BIOS Sea Experience in Shipboard Oceanography (SESO) internship offers Dalhousie graduate students the opportunity to participate in a 5-day Bermuda Atlantic Time-series Study (BATS) research cruise aboard the R/V Atlantic Explorer. The BATS program, started in 1988, is one of the longest time-series studies in the open ocean; as a result, the SESO internships gives students the chance to observe and participate in a series of well-established research and sampling protocols.